Ceiling fan owners know the following situation all too well; It’s time to dust your ceiling fans but a simple task turns messy when dust flies all over the floor and furniture. Now a simple dusting has turned into a thorough floor cleaning complete with vacuuming the furniture. This turns especially yucky when it’s time to clean bedroom ceiling fans above beds and carpet. Is there really a way way to clean ceiling fans without getting dust everywhere? We dig deeper to bring you a few effective methods that will cut down on your cleaning time while leaving your ceiling fan blades dust free. 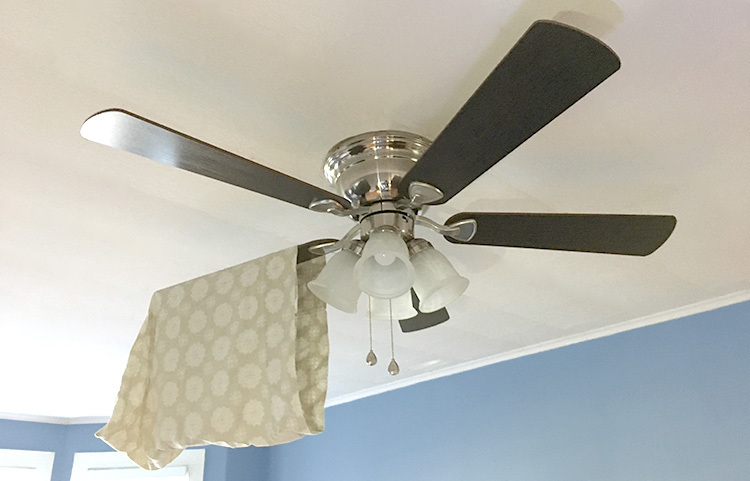 This is a tried and true method of cleaning your ceiling fan blades of dust and debris without the mess. The best part is that you already have all you need right at home! Take a pillow case and slide it over each individual fan blade. Use your hands to press on both sides of the fan blade while sliding the pillow case off. Repeat for each fan blade and before you know it you have a clean ceiling fan without the flying dust. Since the pillow case acts as a dust catcher, you will have some loose dust and debris inside your pillow case when you are finished. Simply invert the pillow case a trash can to shake out the collected dust. To finish cleaning the pillow case just throw it in the wash inside out. Simple right? For those who don’t want to use a perfectly good pillowcase on dust and dirt, the brand FanBladeCleaner has come up with a great solution. Their Ceiling Fan Duster uses the same concept as the pillowcase method but instead gives you a dedicated microfiber duster that is perfectly shaped for ceiling fan blades. The microfiber fabric also allows for a more effective collection of dust for an easier clean. The FanBladeCleaner Ceiling Fan Duster is machine washable and reusable. If you are looking for a simple way to clean your ceiling fans without a ladder then using something like the Unger Microfiber Ceiling Fan Duster is one of the easiest ways to get the job done. Unger is a brand known for their innovative cleaning products that are used both at home and for heavy duty industrial cleaning. Their Microfiber Ceiling Fan Duster makes cleaning ceiling fan blades makes dusting ceiling fan blades a breeze thanks to it’s curved design that allows the duster to clean both the top and bottom of the blades in one simple swipe. The microfiber fabric also does a great job at catching the dust to avoid a mess. The best part? No ladder needed. Just make sure to purchase a telescoping pole if you don’t already own one. Pro-tip: To avoid the mess make sure to give your Microfiber duster an electromagnetic charge so that it allows the dust to stick to the duster. Achieving this is simple and can be done in less than a minute. Grab a plastic shopping bag and and wrap it around the head of the microfiber duster. Then rub it back and forth to create static electricity. Proceed to dust your ceiling fan and watch the magic happen.